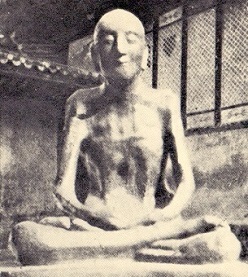 The ability for Chinese Buddhists and Daoists to sit in the crossed legged meditation posture during the death of the physical body, is known as ‘seated transformation’ (坐化 – Zuo Hua). Although Chinese texts on the subject state that this practice is only expected from the most advanced individuals who live a monastic life, it is clear from the history books that many ordinary men and women possessing an unusually strong attitude of spiritual devotion and dedication to practice, have also achieved this rarefied state. Not only does the aspirant ‘pass away’ whilst the body is sat with the legs half or fully crossed and the hands resting on the lap, but the mind is serene during the process from one state of existence to another. When the life force has left the body, it is further expected that the virtuous development of the individual will maintain (or ‘hold’) the body in the upright position for hundreds of years to come. This is usually part of a natural preservation process which sees the body dry-out, but not rot, without any artificial chemical processes being used. However, for particularly pious and spiritually powerful individuals, the bodies are further preserved with a lacquer paste sometimes mixed with gold leaf. This paste is regularly applied to particularly old and preserved bodies. This treatment is only applied to bodies that have not already begun to rot, and are obviously being preserved through other means – in this case spiritual power. Occasionally an old mummy might lose much of its outer layers, but the bones retain their posture as if stuck or held in place. Sometimes people are able to pass away in other positions (such as those described in the story of Layman Pang Yun and his family) with differing hand positions. This Chinese cultural practice might be a development of the ‘Standing like a Stake’ (站桩 – Zhan Zhuan) that sees practitioners of advanced martial arts holding various postures for extended periods of time to build inner and outer strength, as well as a calm and serene mind. Within ‘Seated Transformation’ the Ch’an practitioner is expected to manage the entire process of energy transformation throughout the dying process, and carefully regulate the breath as it falls away and ceases. In the Daoist practice, pre-natal breathing takes the place of post-natal breathing and physical breath ceases altogether as the body and mind exist for a time on the circulation of internal energy. Of course, not all great masters die in this way as is seen by the example of the Buddha in ancient India (who died whilst lying on his rightside), as did Master Xu Yun (1840-1959). However, many eminent Chinese Buddhist masters have passed away whilst sat upright in the meditation posture throughout China’s Buddhist history, and there are hundreds of seated mummies in the meditation posture from hundreds or thousands of years ago. This is not just ancient occurrences, as modern Chinese individuals are still managing to pass away using the ‘Seated Transformation’ process.